We now live in a world of megabits per second speeds, and even gigabits per seconds (802.11ac). Well, that’s what the manufacturers tell us (realistically we are still in the Mbps – megabits per second speed range). Wireless (Wi-Fi) has been around since the late 1990s. It has come a log way since those security-weak days of none-to-poor encryption, where coverage areas were small and speeds were, well…pretty pathetic actually! Of course, we didn’t care so much back then. The fact that we could browse the Internet without cables was so cool! As the years have rolled on, so have the wireless standards. You are probably here because you are confused about what wireless standards are and how they affect you. Well, we’re going to put that right by running through the big wifi standard releases over the years, so you can understand the world of wifi so much better! So what are Wireless a b g n ac routers and what about those speeds? Wireless standards are defined by IEEE (the Institute of Electrical and Electronics Engineers). The Wi-Fi Alliance tests routers to ensure they adhere to the IEEE standards, although this is not mandatory. If a router packaging displays the below logo, it has confirmed interoperability. Also, not every device model is submitted for certification, as it can be costly. Here is a run through of the major wifi standards and the different types of routers. Note that all the speeds quoted are theoretical. Wireless A – What Is 802.11a? Let us start off with the first (actually there was a 802.11 standard before this, but it is so old and antiquated, we thought we would leave that out!). Released in 1999, Wireless A became a standard around the same time as Wireless b. We’ll come to wireless b in a moment. Interestingly, 802.11a was faster that 802.11b by some margin, and was in the 5GHz range. It was capable of 54Mbps, but the speed wasn’t enough in the end. 802.11a ended up like Betamax…although it was an arguably better standard, manufacturers decided to stick with Wireless B, and so Wireless A just didn’t really take off. Because it was 5GHz, it’s coverage area was relatively small. Wireless B – What Is 802.11b? As we just mentioned, 802.11b was released around the same time as Wireless A (in 1999). It became the most popular standard in that time, although speeds were only a paltry 11Mbps. In those days, that was considered to be pretty good, as cabled Ethernet was mostly 10Mbps back then (although the actual cabled throughput was greater than wifi). Wireless B was in the 2.4GHz range and was therefore more susceptible to interference from cordless phones, microwaves and baby monitors around the home. Wireless G – What Is 802.11g? In 2003, 802.11g became ratified. Finally, we saw speeds up to 54Mbps (yeah, seems strange since Wireless A had the same capability all those years ago!). It was again in the 2.4GHz frequency band and was even more popular than Wireless B. By this time, Wi-Fi was becoming pretty popular with consumers due to its convenience. Wireless N – What Is 802.11n? What is Wireless N? The 802.11n standard was ratified in 2009, although the routers were available to buy long before then. Operating in both 2.4GHz & 5GHz, vendors promise speeds up to 900Mbps via 5GHz channel bonding and Dual Band. This is currently the most popular standard of all, although it is expected that crown will soon go to Wireless AC as more devices cater for that standard. 802.11n also say the introduction of MIMO (Multiple In Multiple Out) which can process signals faster and more efficiently, particularly when they are out of sync due to reflections around the home. Wireless AC – What Is 802.11ac? It’s been available on consumer routers since 2012. 802.11ac is the latest wireless standard. Speeds up to 3.2Gbps are possible on the latest AC3200 routers. This newest wireless standard is also currently becoming ever popular. 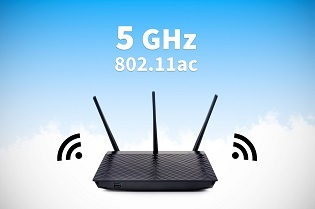 It works on only the 5GHz frequency band, and needless to say, if you are looking for the fastest wireless standard, then wifi AC is the way to go. Wireless AD – What Is 802.11ad? .11ad is the latest and greatest of the wi-fi standards. Uses the 60GHz spectrum, and at time of writing, has only been released on a handful of routers. In fact, there are no actual devices that support it. So, it’s actually confined to wireless bridging between Wireless AD routers. Coverage is very small, and is only useful if there is line of sight between both nodes (because any obstacles, including walls and furniture, decimate the signal). If you can, try to get a Wifi N router. What’s the difference between Wireless N and G? Coverage is better and the speeds are faster. Most devices are Wireless N now and the 802.11n routers are backward compatible with G anyway. In fact, they are also mostly compatible with 802.11b & 802.11a too. So in the 802.11G vs N comparison, or anything released prior to Wifi N, it’s usually best to go for Wireless N router. The difference between Wireless N and AC is mostly speed. 802.11n is still good for most people however, although AC routers are becoming a lot cheaper now. But if you want to future-proof or you are streaming HD or 4K, then Wireless AC routers are best. Also if you are looking for the best gaming router for your Xbox 360, Xbox One or PS4, you will in most cases be better off with a Wireless AC router. No problem, lori. Glad that it helped! You make it so clear. Thank you for that. i really don’t get it at all. I’m trying to buy a laptop online. I’m using the compare option and one of the items is wireless networking. My first choice only has wireless-N listed in that field while another one has A, AC, B, G and N listed, but that one is $170 more and doesn’t have a disk drive. What do you need to connect to? Do you have a Wireless AC router, or Wireless N? Wireless AC is the fastest, widely used standard for clients today. They will be backwards-compatible with Wireless N.
Wireless N is older, but is still fast enough for most users (Netflix, browsing, non-latency dependent online gaming etc). It all depends on your router/client/internet speeds and what you want to do. If you have a less than 100Mbps internet speed plan, then Wireless N should be enough for you. Although there are many variables, and we can’t answer without a lot more info. Both laptops you mention will connect to Wireless N (definitely 2.4GHz, and although I can’t 100 percent confirm, will probably be able to connect to Wireless N 5GHz too). One will not connect to Wireless AC (from the info you have given us).